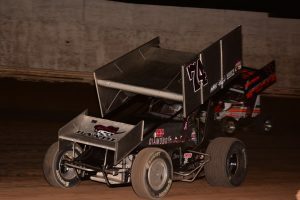 ASCS Wing Sprint Cars and IMCA Modifieds headline Saturday nights event with 2 weeks since their last showing. Colton Hardy will look to keep his 2018 momentum he has built and extend his points lead in the ASCS division. Hardy winner of the last meet leads Billy Chester by 64 points headed into Arizona Speedway and 76 points over Joshua Shipley. Hardy and Chester claimed the top 2 spots last time out with 9 time champion Rick Ziehl crossing the line in third. IMCA Modifieds also saw a break last week and will return with the top 5 in a tight battle. Jeremy Thornton leads the division by only 1 point over Chaz Baca Jr, with Sean Stacy, Tyler Mecl and Rob Colclasure all within 15 points of the lead. With four features into the season and four different winners, we will either see a first time winner in San Tan Ford victory lane or the first driver to get number two on the season at the speedway. Pure Stocks, Modlites and Robert Horne Ford Bombers also on the card. Kevin Parker is on top of the leader board in the Pure Stock division followed by last weeks winner Larry Brigner and Darryn Werkmeister . Seven races in and five different winners on the season the Pure Stocks again this season showing to have some of the stiffest competition. Robert Horne Ford Bombers have Michael Soboski on top of the division with two wins, just 3 points ahead of Jason Knueppel and 28 ahead of Aaron Collier. Modlites return after a layoff and show Sean Conyers at the top leading the series with Dave Lems and Steve Bender in second and third spots. Action begins at 7:15pm Saturday with grandstands opening at 5:00pm and pits opening at 4:00pm. Cost of admission just $15 for all adults, kids 11 and under are free. Pit passes $30 , kids 7-11 pit passes $15 and kids 6 and under free. Arizona Speedway is located within ET Motopark at 48700 N Ironwood Dr. San Tan Valley, AZ 85140 5 miles south of US60 on Ironwood Dr. Call the hotline or logon to www.ArizonaSpeedway.net for more info. 480-926-6688 . Follow us at www.Facebook.com/ArizonaSpeedway .